The Sleepover Party Game is like truth or dare, without the truth, it's all dare. I dare you to lick your own elbow, or be a human mirror and copy someone...really fun stunts and activities to do, and with 200 cards, you never have the same game twice! 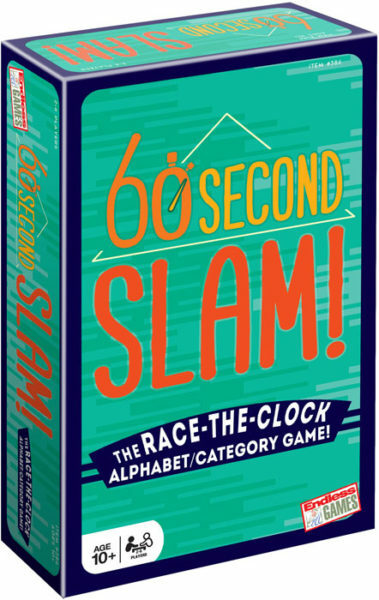 While my kids enjoy playing 60 Second Slam, I feel bad competing against them, because they are slpwer at writing and they have to spell words which takes more time. Casey and I have been playing 60 Second Slam and having a GREAT time. She and I love to play games at the park while our kids run around playing. 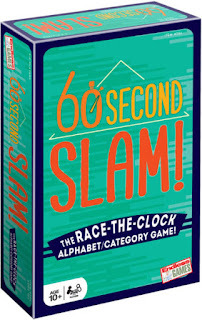 We usually have some form of UNO, Phase 10 and no 60 Second Slam. Can you come up with a word for each letter of the alphabet for the category of “Things in a Supermarket”? Now try “Rock Bands” or “U.S. Cities”. Fill in a word for each letter of the alphabet on your scorecard. Come up with the most answers in 60-seconds to WIN! SO you have a scorecard with a line for every letter of the alphabet, and if the category is things int he supermarket for A you write Apple, B, Banana...and so on. The goal is to get as many letters filled up as you can in 60 seconds, and 60 seconds FLIES BY.